Sooo for $6 x4 you get a head, gun arm and weird wing thing jump packs. Seems like a rip off... 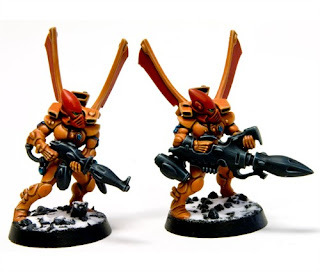 I'm curious to see the new Eldar line GW is going to be releasing if Forge World's trying to cash in on new units well before the new codex release. Or, for almost $30, you can convert 10 normal guardians with their normal upgrade pack. No rules yet, but I can only imagine the next Forge World rulebook will focus on tiding Eldar players over until a new Codex releases. See, this is the reason I've never felt particularly drawn to Forge World. Sure, it looks nice, but further inflating the cost of an already expensive pastime seems counter-intuitive to me.